Fairest is the story of Queen Levana, the embodiment of the evil queen from Snow White. 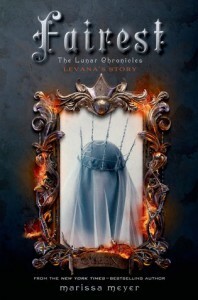 Apparently when she was writing Winter, the final book in the series, Marissa Meyer was having difficulty and ended up starting to write Levana's story which turned into a book of its own. Unfortunately this ended up pushing back Winter's release date to the fall. Her next book Heartless is now coming out next year instead. But it's another book and a great one. It starts with the funeral of Levana and Channery's parents due to a shell assassin. Channery becomes Queen, but has little interest in the politics while she enjoys herself and taunts her sister. Levana enjoys the political scheming and has ideas of how the planet should be run. But she is also withdrawn because of the burns on her face her sister inflicted while they were children. The book follows as Levana falls in love with a married guard and schemes to get him, and eventually the throne, before turning her gaze to the earth. Would Levana have been so cruel without her sister? I don't know. But I am happy we got this book because I was a bit confused on what exactly had happened. The book can technically be read before the series, but I think it is placed best in published order before Winter.